If your laboratory conducts research in any of the following areas, environmental organic analysis, organic analytical chemistry, petroleum analysis, food chemistry, forensic organic analysis, organic geochemistry, and any scientific research that requires solvent reduction. FlexiVap can greatly increase your lab productivity, especially if your research requires processing large numbers of samples. 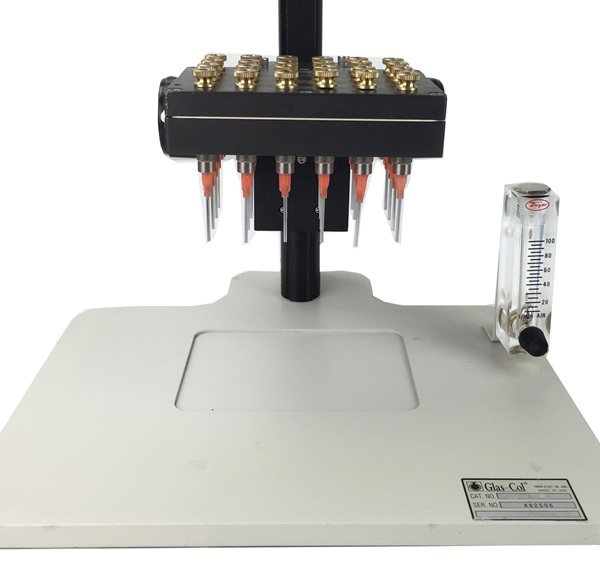 You or your students will never again have the mess of setting and dragging the pipettes or needles around in a nitrogen manifold, with just one FlexiVap in your lab. The main advantages of the device relative to those currently on the market are: - Fully flexible with all vial sizes used in a lab, with just one manifold. Vial sizes can range from the standard EPA 40 ml and 20 ml vials (e.g., those used in Dionex ASE) to 4 ml and 2 ml vials. 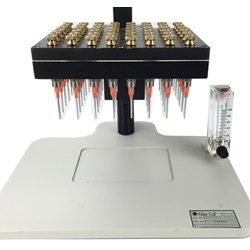 There are two model sizes, one model can simultaneously evaporate solvent from 24 EPA (40 ml) vials or 48 (4 ml) vials, another model can deal with half the number of vials simultaneously. You will only need one system in your lab to meet all solvent evaporation needs from all different vial sizes. The larger size model will handle 24 large vials from ASE simultaneously - same as TurboVap®, but the FlexiVap is far more flexible (see below). - Easy open and close of any individual gas port and allows individual flow adjustments. If you do not need to use all gas ports, shut down the specific ports easily: you will save nitrogen gas and avoid contamination from dust stirred up by unused ports. 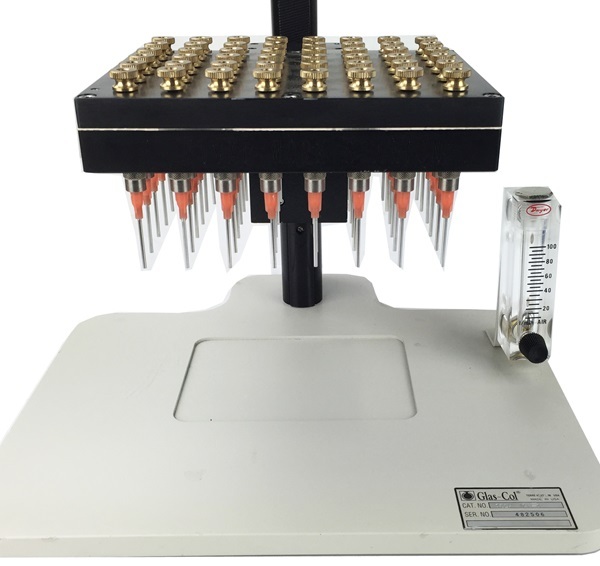 - Complete equal flow rates from all ports (regardless how many ports are open or closed), so all your samples are blown down simultaneously and avoid overheating of sensitive compounds in early-dried up samples. - Automatic holding of needle positions with a high quality jacking stand. Easily adjust the height of needle positions. Easy cleaning of needles, no chance of blowing away your samples due to nitrogen outbursts. - Much lower cost than other evaporators on the market. Click on the Evaporator Accessories listing to select the correct block for your FlexiVap application. larger insert needed for 48 positions.